Knocking two dishes off of my list on this Tasty Tuesday at Lulu’s, Located at The Homeport Marina in Gulf Shores Alabama. Before I get to the food, Lulu’s is a pretty cool place. It has gone from a burger and a beer place to an entertainment destination. Started by Lulu Buffett, who happens to be the sister of the famous singer, Jimmy Buffet. This place serves 4,000 people/day. Yes, you heard that right. It is located on the beautiful inter-coastal waterway. I’ve never been lucky enough to hit the seating lottery for a coveted waterside table and yet, I have still been able to see the passing boats. With good food and live music, it has that laid-back beach style. #12 or 89 on the countdown. 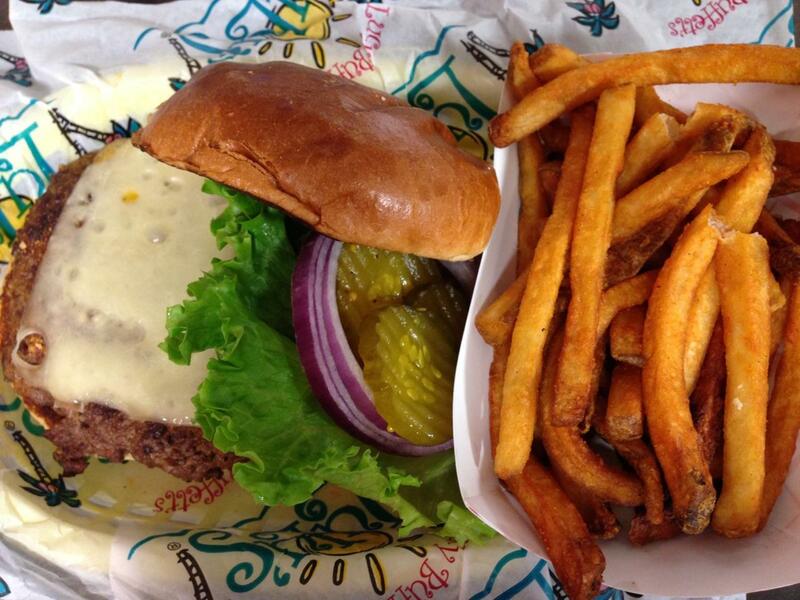 “Cheeseburger in Paradise.” Of course, Lulu’s sandwich is named for the famous song by Jimmy Buffet. Turns out, there is a story to this cheeseburger. Jimmy was on a long boat ride to the Virgin Islands and had too many peanut butter and jelly sandwiches. He was craving a big juicy burger and found one at an American style burger place. History happened. True story. -Huge Thank You to the helpful Lyndsey L. who helped me with this photo. I lost mine in a phone switch. So aside from it’s famous links, this burger is really delicious. No short steps for a good burger. It is hand-pattied from all natural, local grass-fed beef, Seasoned with Lulu’s salty-peppa, served with fixings and your choice of cheeses. 1. May is National Hamburger Month. 2.There are several claims to who/where the first hamburger was invented. Near my hometown of Appleton, in a village named Seymour, Wisconsin, a man named “Hamburger Charlie” is recorded as selling his invention (flattened meatball in a bun) at the county fair in 1885, so that folks could walk around and eat. .He named it after the hamburg steak, which many of the residents were familiar with. Wisconsin boasting the highest German population in the U.S.
#13 or #88 on the countdown. Turn’s out #13 is a charm.L.A. 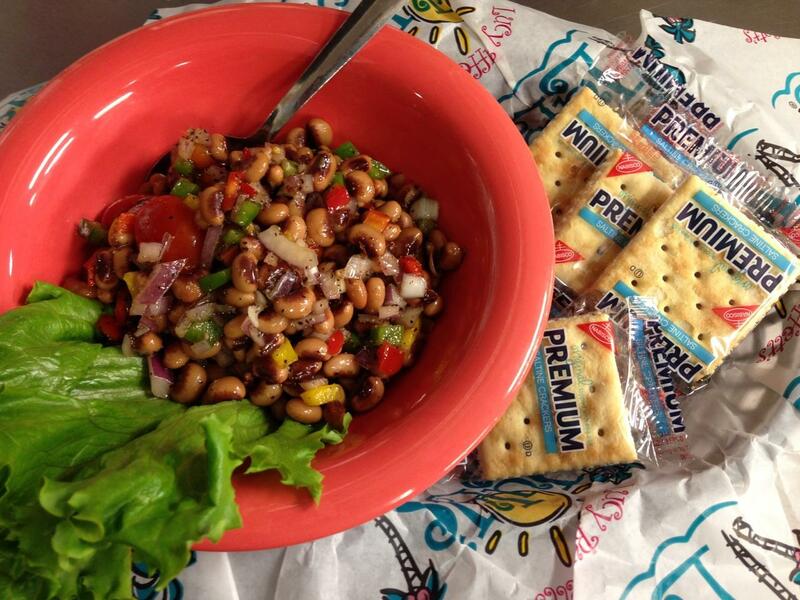 Caviar of Black-Eyed Peas-Lower Alabama Caviar. A dip served with chips. black –eyed peas, chopped red, yellow and green bell peppers, quartered cherry tomatoes, parsley and red onion tossed in balsamic vinegar, olive oil, black pepper, salt and sugar. I really liked it. Great for a sharing appetizer. This great photo much thanks to Lyndsey L. of Lulu’s. The people at Lulu’s are really nice, professional and attentive. Thanks Lulu’s! Lulu’s is known for fresh seafood. I had just been at a few fine dining seafood place and I have to say that my food at Lulu’s was as good if not better than the $$$$ places. Other dishes that I have tried at Lulu’s are; Fresh blue crab, fried green tomatoes, smoked tuna dip, peel-and-eat fresh Gulf Shrimp, fried okra, “Crazy Sista’s” crab toast, fresh Gulf Snapper and Gouda grits, and Lulu’s Fish Sandwich. Last of all I have tasted the Krispy Kreme Bread Pudding, So Good! This was Crazy Sista’s Crab Toast- YUM! -Shrimp and Grits with Gouda-This is not on the list (my pamphlet happened to be in the way.) I didn’t think I would like this dish, but OH SO GOOD! If you have kids, this place is pretty great. The grounds are huge with sandboxes, hula hoops, bean bag games. There is a giant three story area called the Mountain of Youth, that is a huge rope climbing course. And, The Fountain of Youth, where the lil one’s can cool off. Lots and lots of children. Of course, there is a small shop full of anything Lulu’s. MEGASTARS; I give this place a full 5 stars. ***** Why you ask? **LOVE the food is actually extremely good. Better than I have had in a 5* on this visit. **** Because Lulu’s meets the criteria of using local food with pride.Well done! ***** Because I actually wanted to die when I ate some of this food. Like the grits with gouda, crab toast and Krispy Kreme Bread Pudding. would not have wanted to miss this stop. Be prepared for a long wait. Lulu’s does not take reservations. I have been able to get seated within 30 minutes each time I visited. But they were during off season/weekend times. They cap the wait at two hours, so beware. Try to get a water side table. Don’t like kids or Disney Atmosphere-Don’t Go, or go and try to get a place at the bar. After a few Bama Breeze’s you will think the little darlings are alright. They are open til 9 or 10 pm. So maybe go late? (Memorial Day until 11pm.) It can be loud and hectic.